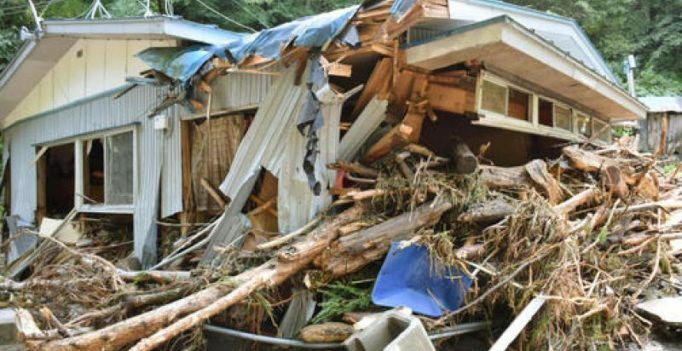 Tokyo: 17 people were unaccounted for in Japan Thursday after Typhoon Lionrock tore through the north of the country, leaving 11 people dead and some 1,600 cut off in isolated communities, officials said. Another body was discovered not far from the care home, while another person died in the city of Kuji. Iwaizumi, with a population of about 10,000, failed to issue an evacuation advisory near the care home, according to the Iwate prefectural government. Lionrock also caused devastation on Hokkaido, the northernmost of Japan’s four main islands, flooding vast areas on the heavily agricultural region, leaving at least three people missing, according to the government.